Dynamic Web Branding is the brainchild of Shahryar Sadree, and a subsidiary company owned by Shahryar Sadree Designs LLC. Sadree and his team have been working together on projects since 2008. Web advertising and Search Engine Optimization became a specialty. This company does something different though. Specifically, With Sadree’s coaching. their focus is to prepare businesses for advertising, by educating the business owner on how to get the most value from any money spent on advertising. Brand building isn’t a new idea in the world of marketing. The big corporations have been doing it since they were small businesses. They knew their value and how much impact having a brand makes. In fact, every super-sized business started out as a small business. They started out small, but with a vision. Branding your business isn’t a huge investment to make, but it is a very worthwhile one. If you want to stay in business, you have to invest something in it. Think of what you already have invested… money, sweat, tears… TIME. The big businesses spend millions per year to improve their brand and image. The Internet became publicly available in 1991, and it leveled the playing field for every industry you can imagine. The music industry felt the blow first, then the advertising industry. Consequently, phone book companies began to go online. Gradually, some small businesses pursued their own independent campaigns. Those businesses that did early on, are now top contenders in their markets. There is still hope for those who didn’t. Dynamic Web Branding focuses on brand building. Sadree has been branding his businesses since 2002. Along with that, he has also established a very impressive reputation as a business owner that truly cares for his clients and his credibility. The company’s short history is only a new chapter to a decade long journey getting familiar with the byways of the information super-highway. 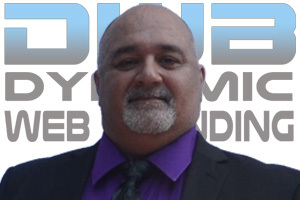 He and his team are dedicated to helping any business owner achieve a strong web presence. Want to know more about how we do it? Click here.